Basketball season is right around the corner, coaches and players are preparing to take the court with high hopes, as they prepare for another season of Timber Creek basketball. “We have many seniors going into this season, we’re feeling confident in their ability, and we’re hoping to have that experience result in success” said Coach Mouser about his varsity team. “We have a mindset to accomplish our long term season goals, and build off the successful year we had last year” says senior David Valmore when asked about his team’s mindset for the season. The Falcons look to have a strong 2017-18 year, the hopes are definitely high. Timber Creek Sports Network is entering their third season broadcasting TCHS Basketball with big games against 3-6A District rivals. Sports Net will be out for four nights of TCHS basketball, streaming boys and girl varsity basketball on the following dates. Friday, Jan. 5, 2018 will be the tip-off for winter sports action with a varsity game versus Abilene. Click here for that game. One week later, Timber Creek takes on Fossil Ridge for a Friday night battle on Jan. 12, 2018. Click here for that game. 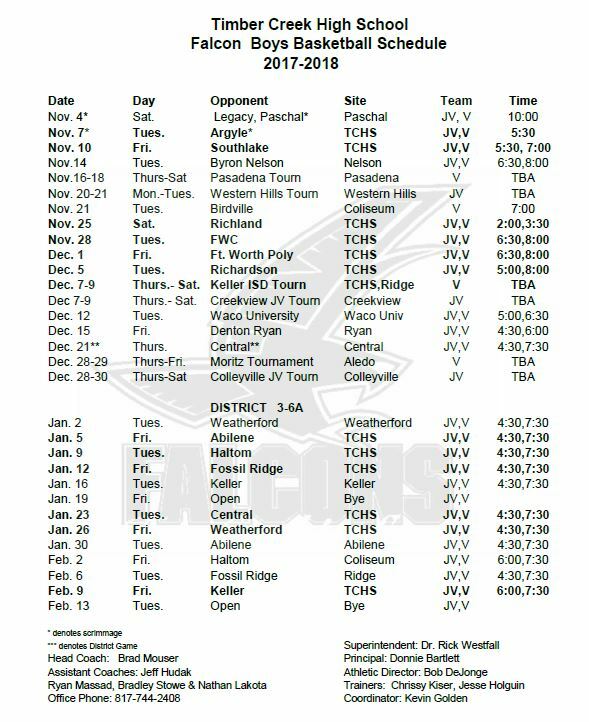 Then TCHS takes on Central on Jan. 23, 2018 for another district game. Click here for that game. Finally, the streaming season ends with the Keller game on Feb. 9, 2018. Click here for that game. For all Timber Creek Sports Network games, an NFHS Network subscription is required to watch the game live or within the first 72 hours after the game begins. Following that time, all replays are free to view.